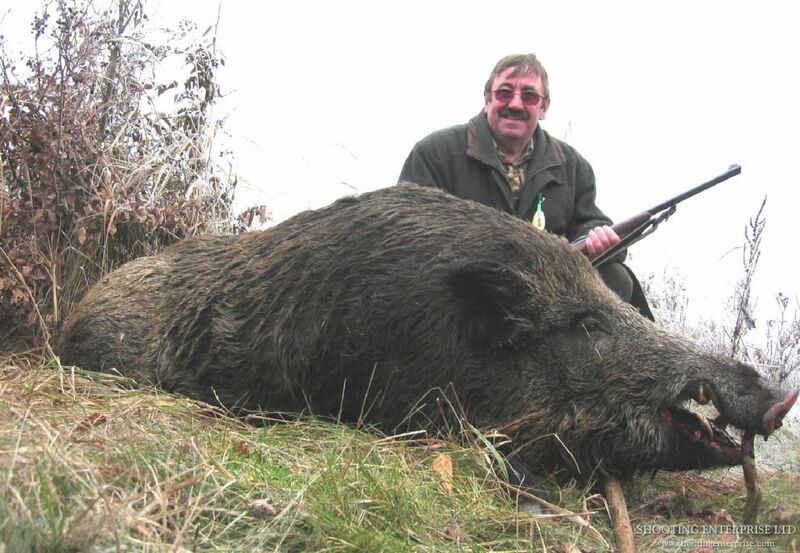 Wild Boar, Hog Hunting | Hunting and shooting in Czech, Slovakia, Europe - Shooting Enterprise Ltd.
Wild boar hunts are most sought after - a spectacular magic, especially during the moonlit nights. Many hunters have taken a fancy to collective hunts for wild boars where a big bag of tuskers is not an exception. Two types of wild hogs in the Czech Republic and Slovakia: Sus scrofa scrofa and Sus scrofa atilla. The difference is colour, growth and shape. 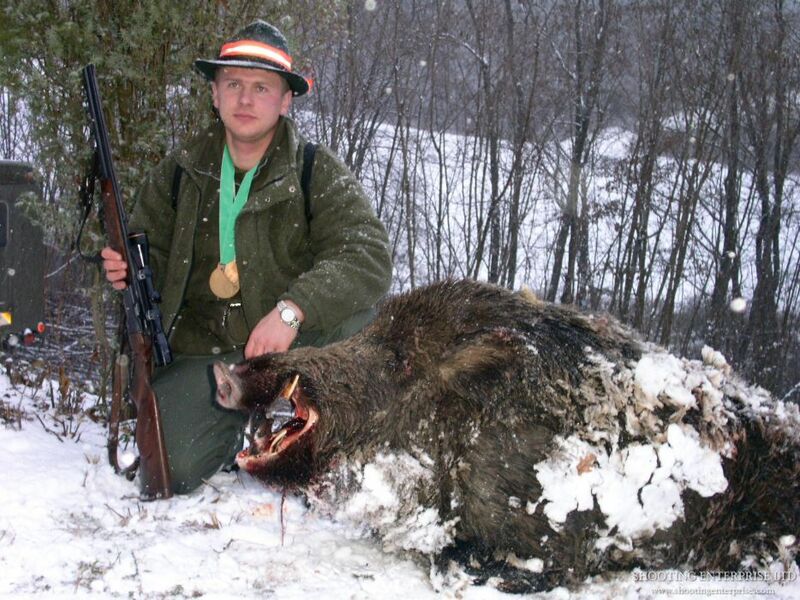 Wild boar hunting in Europe, especially in Czech and Slovakia has grown dramatically. In 1918 only 300 boars were taken in Slovakia; in 1954 more than 1,200 and today over 120,000 per year. Wild boar can be stalked on foot, shot from high seats or driven towards waiting guns. Wild boar hunting on our managed estates helps ensure that your group will have a boar flushed and driven, but that's where the predictability ends. From there it's your responsibility to take advantage of any mistake this unpredictable animal makes. And though you'll be wild boar hunting in some of the most beautiful land in Central Europe don't be too distracted by the scenery; as soon as a boar is driven, your concentration on the task at hand must be total. 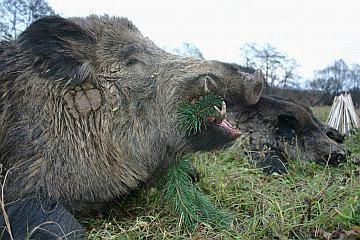 If you would like to now more about boar, hog, tusker, hunting in Europe, driven boar / hog shooting in Czech and Slovakia please visit our educational page click here. Many of our shooting parties mix boar hunting with other game hunts. Find out how we can organise this for you by calling us on 00420 608 321 477 or complete this form. A variety of accommodation is available from magic chateaus and luxury hotels to traditional lodges. We'll take care of all the necessary paperwork and shooting licences. Boar hunting requires rifles. On the driven boar hunt some guns also use shot guns with appropriate ammunition which can be supplied upon request. Temperatures in the winter season are cool to cold; November to February ranges from 5° to -10°C. If you're in doubt about the most appropriate clothing to wear just call us on +420 608 321 477.